It has been a while since I've attended a Hatchi dinner but the presence of Walter Manzke more than enough reason to go. After having made a name for himself at Bastide then at Church and State, I think much of the LA's food cognoscenti came out hoping to get some hints of what Chef Manzke has in mind next. In fact the reservations filled up so quickly I would have missed this dinner were it not for my friend who was kind enough to give me a seat at his table. Almost after we sat down we were presented with a deconstructed ceviche. 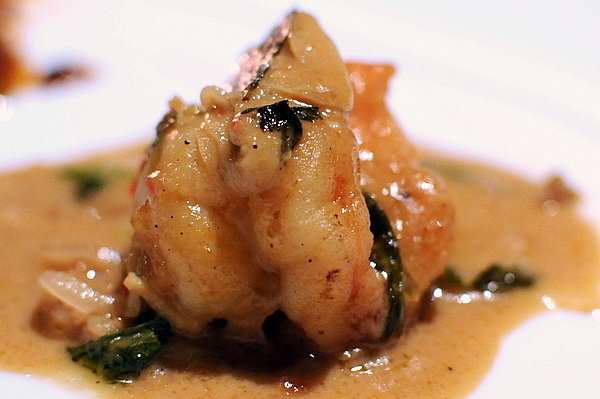 The grilled shrimp was a touch overdone but had a nice smokiness and spicy finish that made up for the flat texture. The chaser was subtler than I expected, more like a gazpacho than the more astringent classic ceviche marinade. 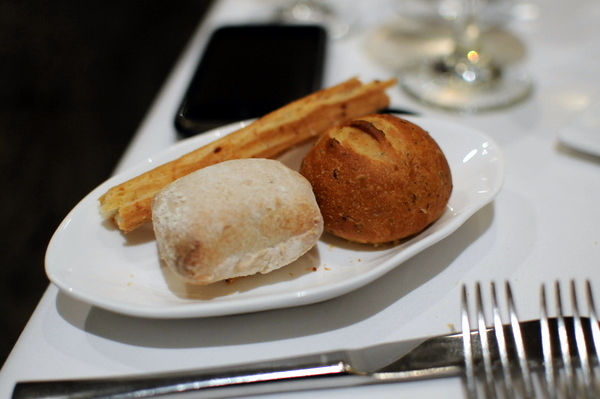 With the spotty service we decided to order some bread to tide us over between lulls. As expected of a restaurant named BreadBar, the Epi was delicious with a crisp skin and an overwhelming aroma of freshly baked bread. 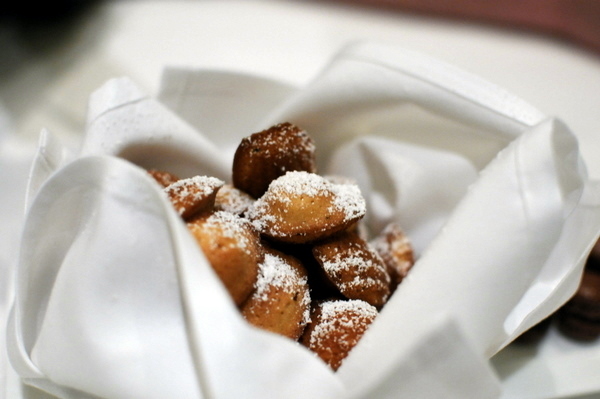 Delicious on its own or smeared with the honey-sweetened foie gras butter. 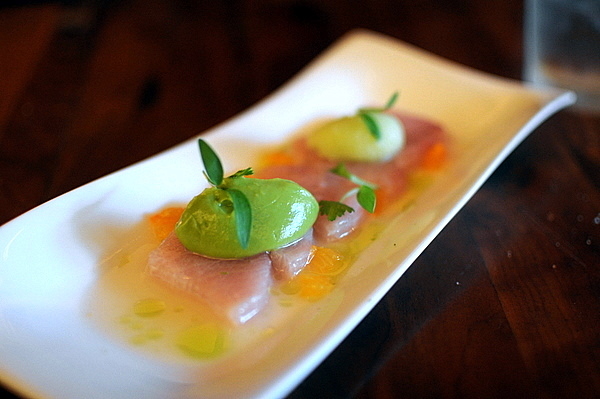 As with the Shrimp Ceviche, the yellowtail ceviche was light on acidity. Instead I got a mouthful of soft citrus on the attack and a salsa-like zestiness on the finish. The staff forgot the wine pairing and ended up bringing both Sake and a Pacifico Beer. A cleaner sake would have been better suited to the delicacy of the fish and the Pacifico just tasted bitter against the sweetness of the sorbet. I didn't see how a white corn soup would be representative of Thailand but in fact the curry and coconut tapioca were spot on. 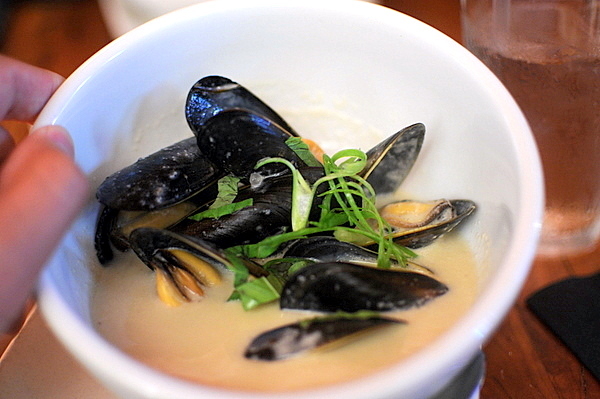 Though I found the dish too sweet, I thought they tempered the aggressive brine of the mussels which worked to the benefit of my companion. I was expecting this to look like something out of Lee's Sandwiches. 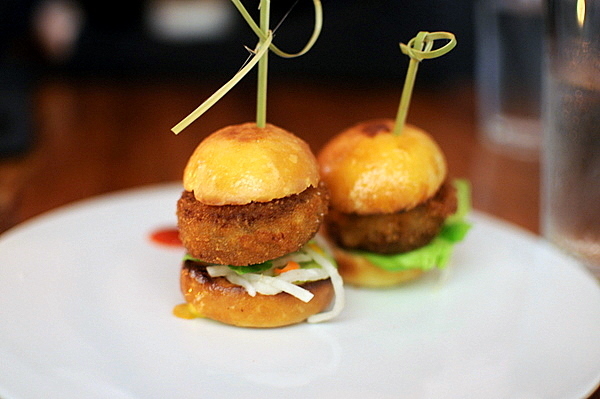 Instead this looked like a traditional slider with a patty of nicely fried pig's feet coupled with pickled carrot and daikon. The rich pig's feet patty was similar to a pulled pork with a nice crispy batter and the intense spice and tanginess of the veggies was the perfect counter to the fattiness of the pork. The sliders were absolutely delicious, but I just wish I could have felt some of the distinctive texture of the pigs feet. Spot Prawns have been one of the most inconsistent ingredients I've seen across restaurants, too often they come out overdone or under seasoned. Happily this was neither, deliciously snappy and meaty with a sweet brine that reflects the freshness of the crustacean. 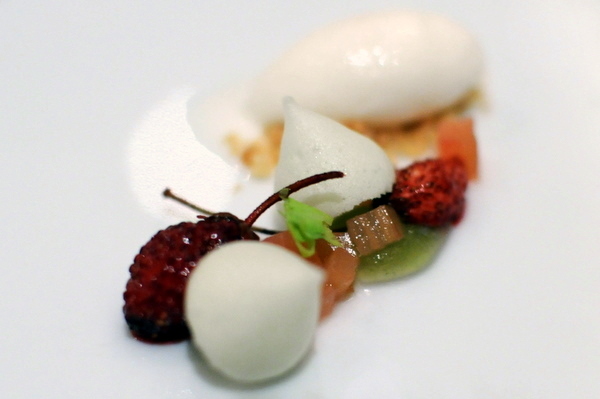 The second I saw this on the menu I had images of the divine Sweet Pea Agnolotti at Spago. Add to that my penchant for runny eggs and this was my early frontrunner for best course of the night. 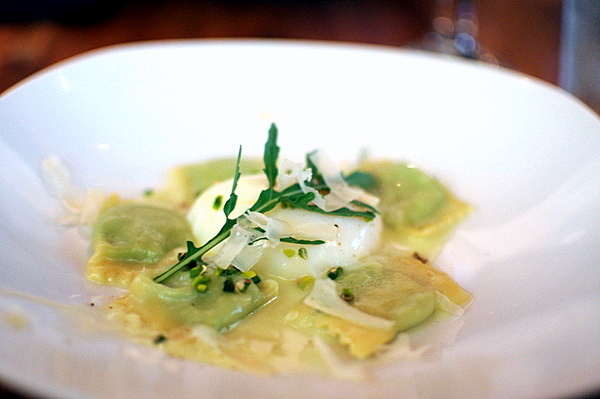 The ravioli was spot on, sweet and herbaceous with a shade of mint to boot. 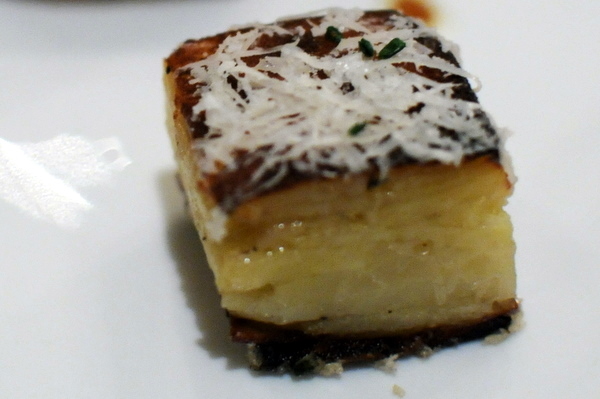 The Parmesan added some savoriness and weight but there just wasn't enough. The staff really laid it on with this dish; the servings could have been split in half and still been plenty. 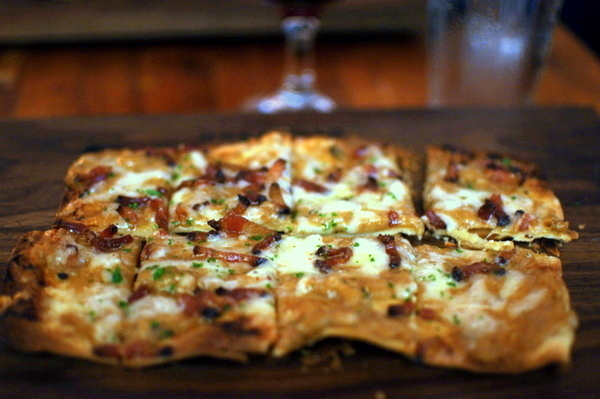 Simple and simple and delicious in intent, the clean nuttiness of the cheese bridged the sweetness of the onion and smoky flavor of the bacon. 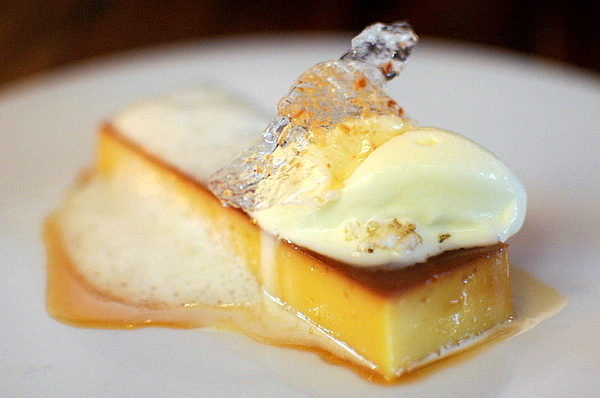 Think tres leches cake mixed with flan. The custard was substantially denser with a pervasive flavor of condensed milk. The coconut was a nice touch adding a complimentary layer of flavor reminiscent of the coconut soup with tapioca served at Chinese restaurants. Luckily we had a fairly early reservation since they ran out of this course by the time they got to us. The chocolate fondant was nothing spectacular on its own but grew considerably with the addition of the green tea and sesame ice cream. 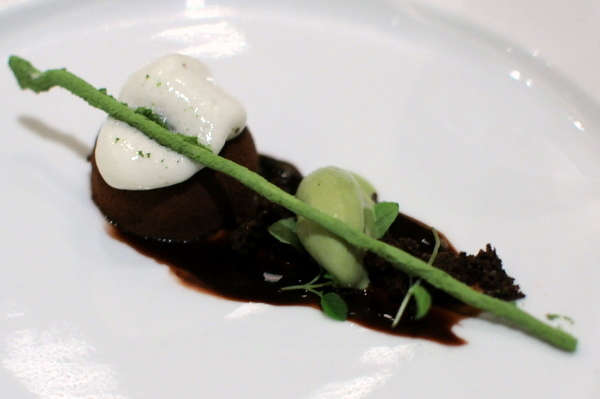 I particularly enjoyed the hot/cold interplay between the ice cream and the fondant as well as the verdant bite of the matcha which proved to be a good counterpoint to the richness of the chocolate. One of my complaints with the early Hatchi dinners was the quality of service. Thankfully service has improved markedly; hough there were some missteps, particularly with the timing of the wine pairings. Still that paled into insignificance against the main attraction, Manzke's food. Overall, I was underwhelmed, some of the dishes were absolutely superb, while others needed some fine tuning. Still I liked what I saw and it is my expectation that things will be better when we see the finished product. Ah how the mighty have fallen. Successful people often have their share of detractors, but I don't know anybody so universally reviled as Chef David Myers. He has drawn a plethora of expletive-laden vitriol attacking everything from his integrity to his sexuality. A classmate of mine whose wife worked for Myers diplomatically described his leadership style as "strict" and "very old-school." Others have not been so kind, calling him an ego-maniacal iron-fisted tyrant, and attributing Sona's success to his Chefs de Cuisine. Despite the current atmosphere of hate surrounding Chef Myers, there was a time it seemed he could do no wrong. 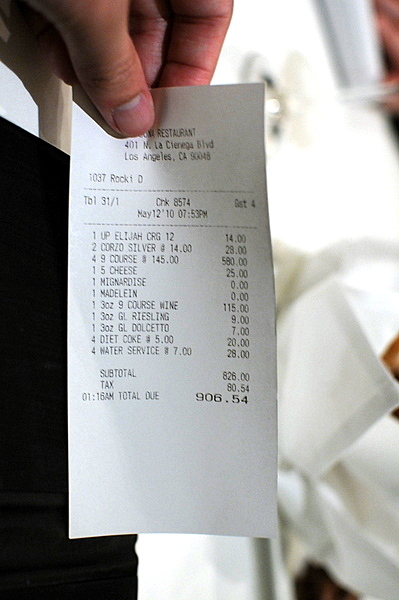 Sona established a legitimate reputation as one of the top restaurants in LA. Comme Ca was a pioneer in a wave of French bistro/brasserie restaurants. Capitalizing on his initial success, Myers and his Food Art Group went on an expansionist blitzkrieg the likes of which I have never seen. It was around this time the momentum Myers built began to falter; it seemed that Myers was more interested in opening restaurants then actually running them and these newer undertakings never achieved the stability and quality that marked his earlier ventures. The first cracks in Myers' empire showed up in Febuary of last year with the shuttering of Boule Atelier. It seemed that the house of cards was about to tumble with restaurants closing as quickly as they had opened. At the same time Myers continued to burn up the goodwill and credibility he had established. Numerous personnel changes and restructurings marked an organization in the midst of its death throes. Finally Myers announced the closing of Sona, the crown jewel of his empire, in May of this year albeit with a planned reopening sometime in 2011. Considering my memories of the restaurant it would be inexcusable not to see it through its final days. 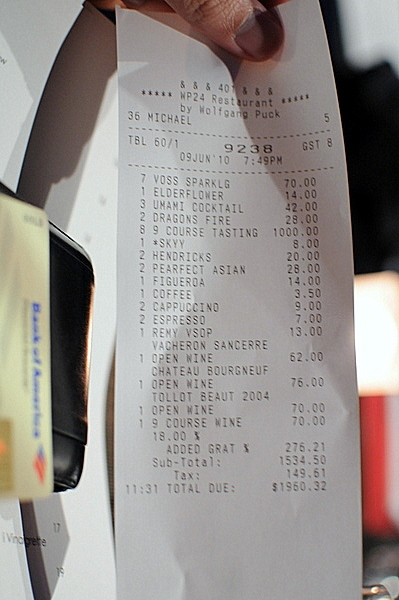 My first visit to Sona came shortly after a food trip that included dinner at The French Laundry. I recall being very impressed and thinking that the meal compared favorably to even the vaunted Laundry. 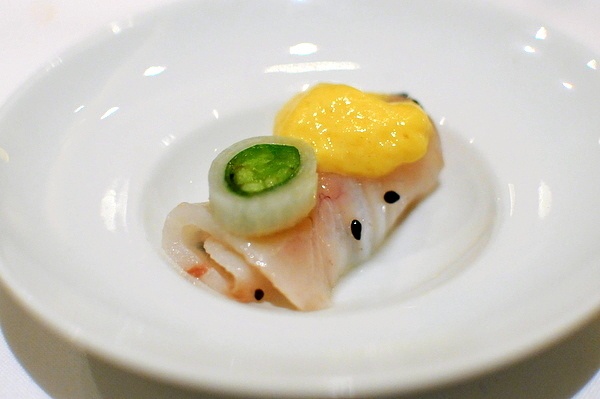 A return visit in 2009 told the story of a restaurant that had lost its way, neither Chef Myers nor Chef Yagi were present during service (away on a business trip) and the food, while passable, was a far cry from the exquisite meal I remember from years past. 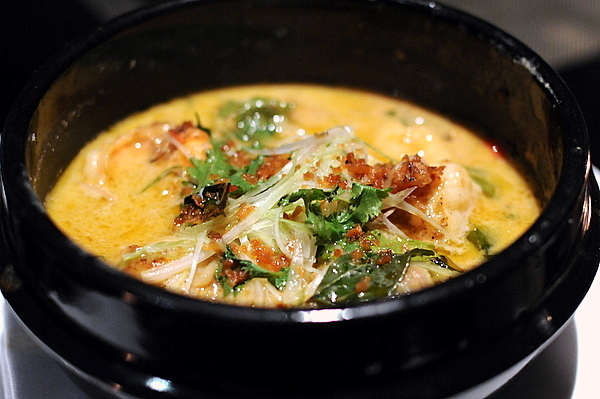 Sona has always exhibited Asian influences, reflecting Myers' interest in Asian food culture. 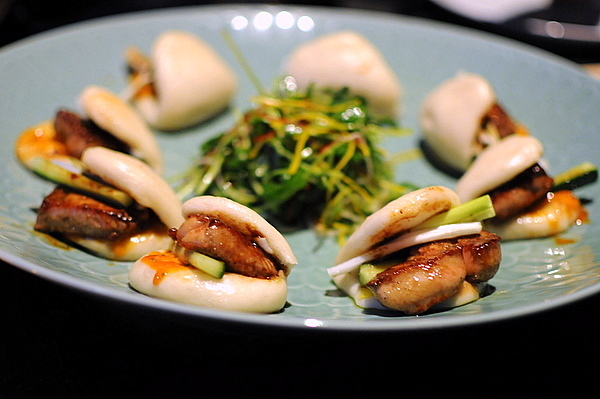 The rise of Chef Yagi seems to have pushed the restaurant even further in that direction. The restaurant is one of the few to offer a tandem tasting, where there are two options for each course. 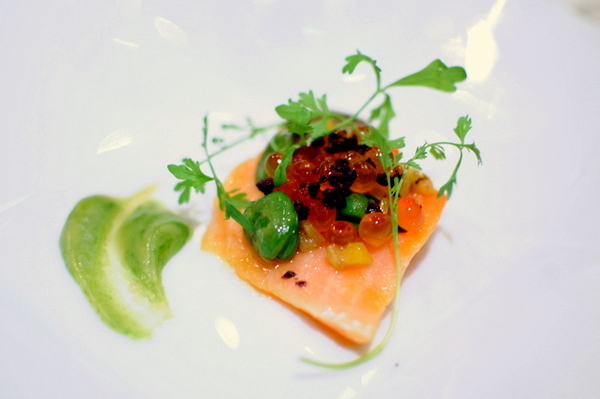 Of course nothing less than the 9-course tasting would suffice for a last meal but Chef Myers had something different in mind, free-styling a special menu consisting of whatever he felt like serving; a true omakase experience! 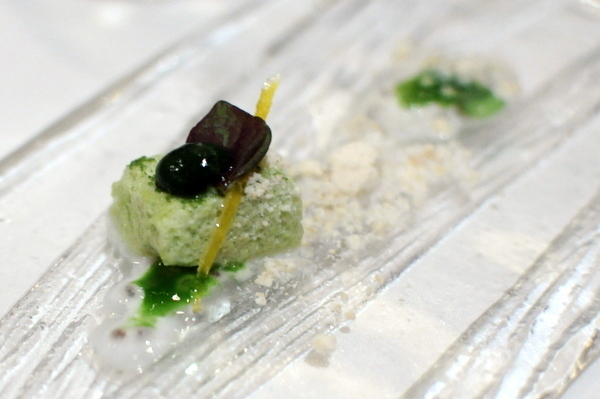 Intriguing choice to start with, the cool sweetness of the fruit and soymilk would have been a bit flat on their own, but the verdant bite of the cilantro and crispy savor of the rice cracker added a welcome depth to the mix. 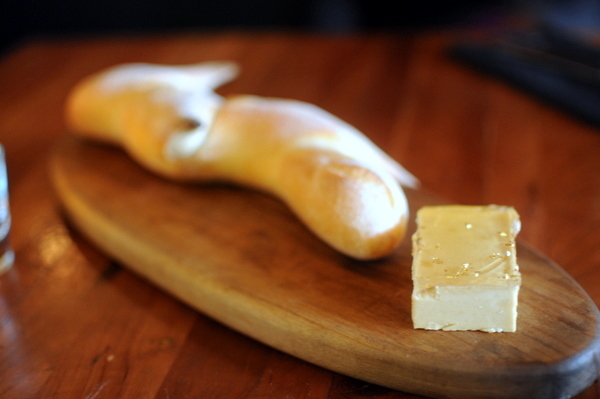 The bread came in several waves, the first being a giant Parmesan bread stick that buckled under its own weight. 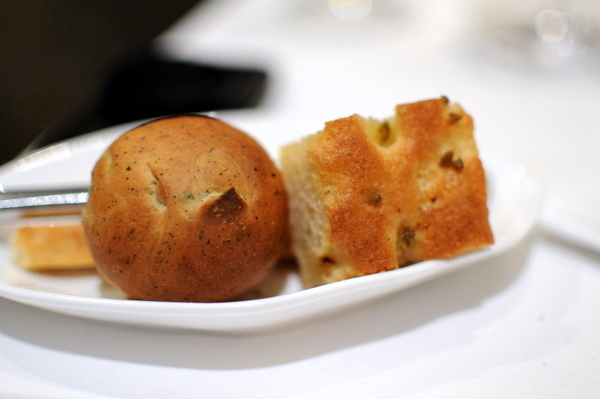 Of the four subsequent breads the garlic pepper and black tea were both particularly noteworthy. Inspired by the importance of the number 5 in Japanese culture and kaiseki tradition, this dish incorporates 5 colors and elements of all 5 tastes. Though the colors don't quite match the traditional black, white, red, green, and yellow the result is still a dish that is as visually appetizing as it is delicious. The mint and pea amalgam harmonizes nicely with the natural essence of the crab and the resulting flavor is both delicate and complex. The Shima Aji came loaded with thick veins of marbling and a fattiness reminiscent of a top-notch o-toro, quite different from the lithe character normally associated with the fish. The crisp vegetal counterpoint of the cucumber-shiso roll paired immeasurably well with the velvety richness of the fish. Strange serving two dishes where crab is the feature so close in proximity. Though some of my friends rave about soft shell crab I've never seen the appeal; finding the effect sort of like eating a shrimp with the shell on. The crab itself was almost painfully salty, to the point that it was nearly unpalatable on its own. 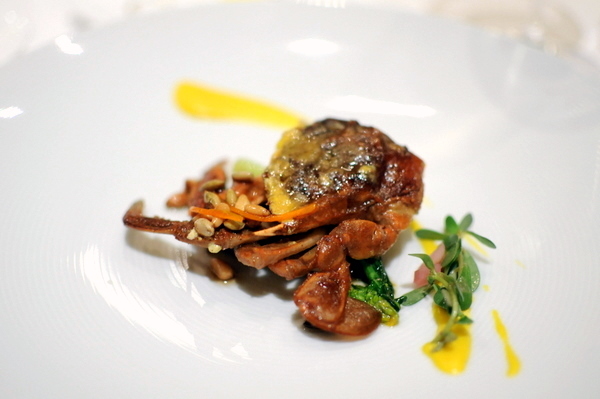 Even with the vegetables, the too-forceful nature of the crab came through clearly. The trout was served nearly raw with but a thin seared layer that added a intensely smoky depth to the briny unctuousness of the fish. 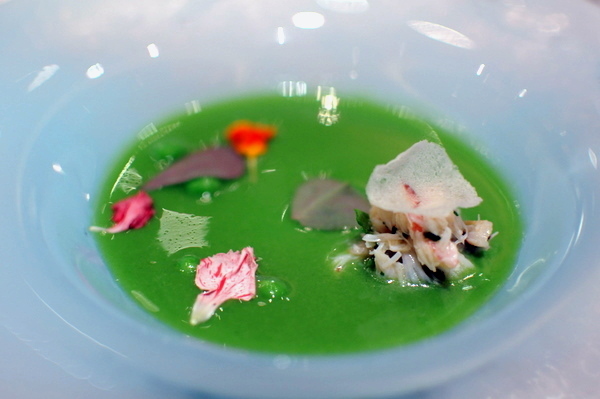 A smattering of herbs added a ringing vegetal component that completed the dish. 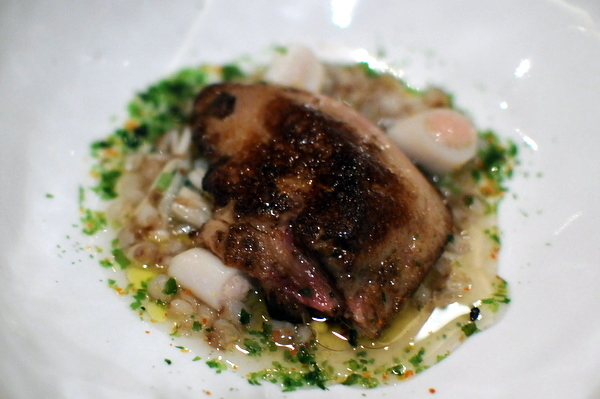 Next up was an audacious preparation of seared foie gras paired with razor clams and buckwheat. Sadly the clams were less of a factor than I would have liked, as their snappy texture and salinity would have contrasted nicely with the fatty liver. 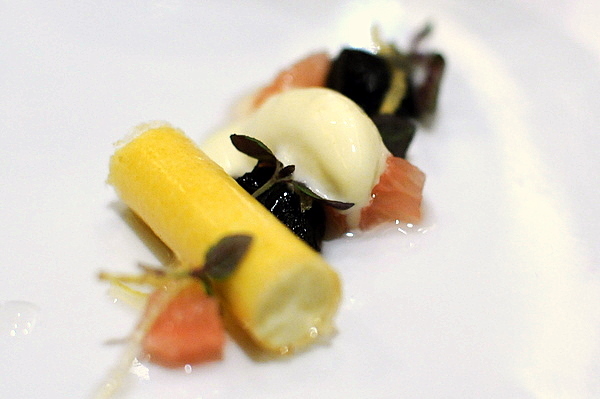 Still the remaining accompaniments were up to the task of countering the weight of the foie, with the pronounced peppery bite and twang of fresh citrus resulting in a pervasive sweet-umami essence. I've often seen black chicken used in high-end Chinese soup stock, but rarely have I had the bird on its own. We were served a piece of the thigh which was substantially more muscular and flavorful than your typical supermarket bird. 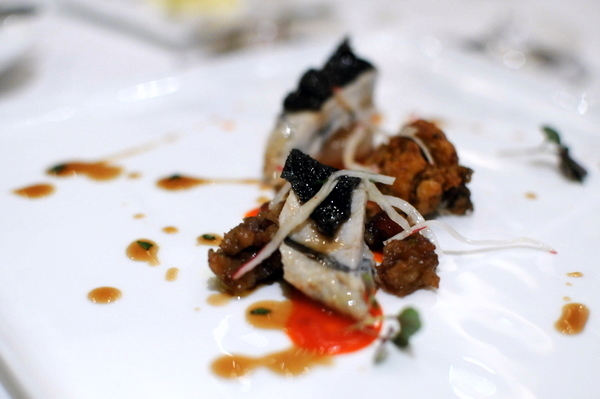 The stronger flavor stood the bird in good stead when paired with the potent flavor of the licorice and piquillo pureé. Absolutely superb and something more chefs should consider working with. Veal is a dicey proposition at many restaurants; vaunted for its tenderness, I often find the meat bland and dry. Thankfully this was not the case here and we were given two delightfully contrasting preparations. 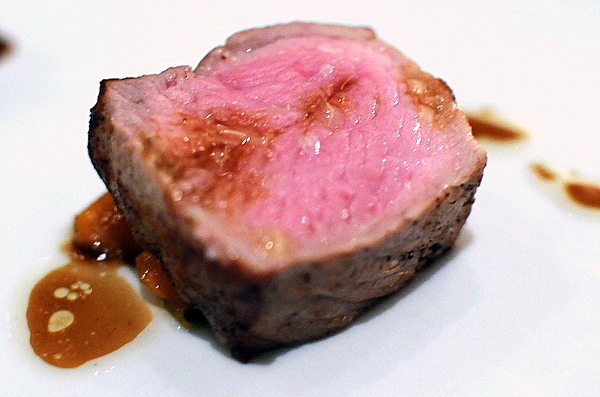 The loin was immensely flavorful and moist but with some firmness to it; a true showcase of the best aspects of veal. The braised cheek was utterly decadent and all but dissolved on the tongue. 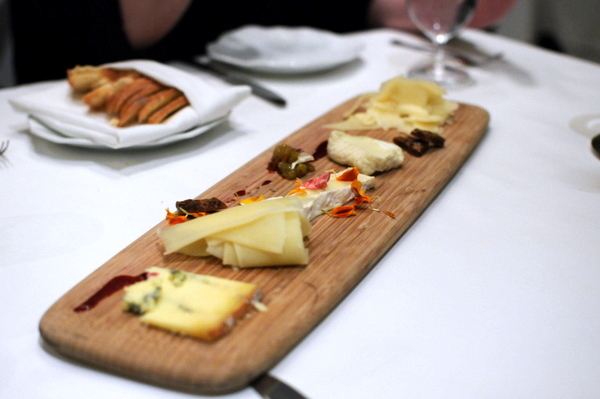 Fromage at Sona will always have a special place in my heart as Sona was where I learned to appreciate fine cheeses. This proved to be a superb selection, running the gamut from firm to gooey and from mildly nutty to full-flavored. Not to be outdone by the exceptional savory courses, we were presented with an equal number of elaborately crafted desserts from Executive Pastry Chef Ramon Perez. 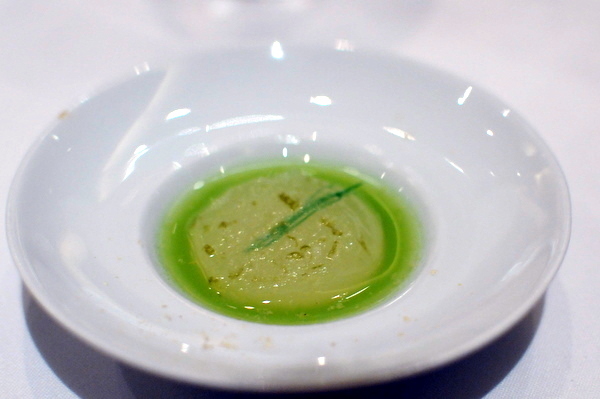 First up was a palate cleanser strait out of Ferran Adria's playbook. The thin membrane of fennel burst on contact, releasing an herbaceous concoction of apple, cucumber, and licorice. The mint cloud lived up to its name with an airy chalky texture punctuated with a tingling mintiness. One of the more cerebral desserts of the night. 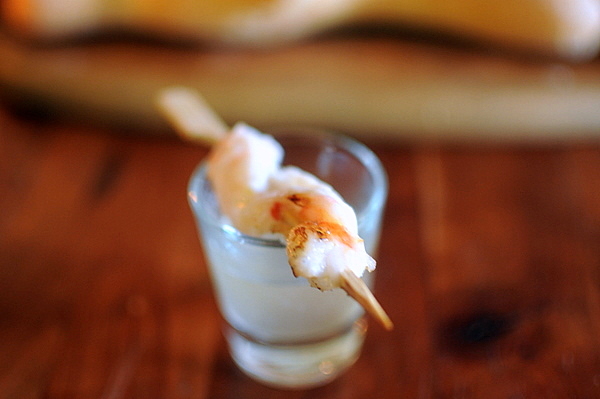 The interaction between the tart lime and spicy ginger was unlike anything else with a pronounced savoriness to boot. Celery is one of my least favorite vegetables so I didn't think I'd welcome it in a dessert, but the herbal flavor was the ideal foil for the jammy sweetness of the fruit. The vibrant orange cylinder looked so sweet and inviting that the harsh burn of the Licor 43 came as quite a surprise. Unfortunately the alcohol rendered much of the dessert incomprehensible. Kevin likened this dessert to a Chinese Tongyuan and I found the comparison particularly apt. The caramel popcorn reminiscent of a kettle corn, was enjoyable but stood apart from the black sesame. 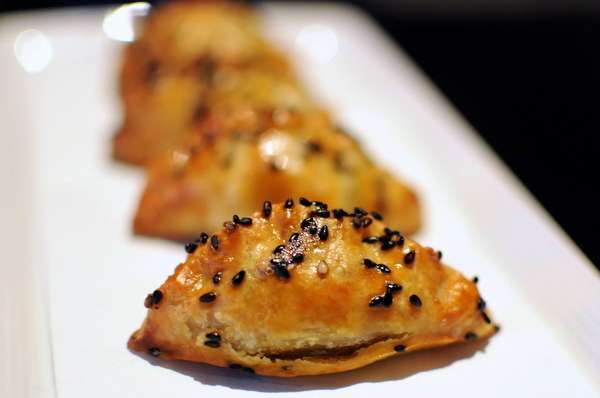 The passion fruit provided a vibrant fruity contrast so effective with the heavier flavors of the popcorn and sesame. 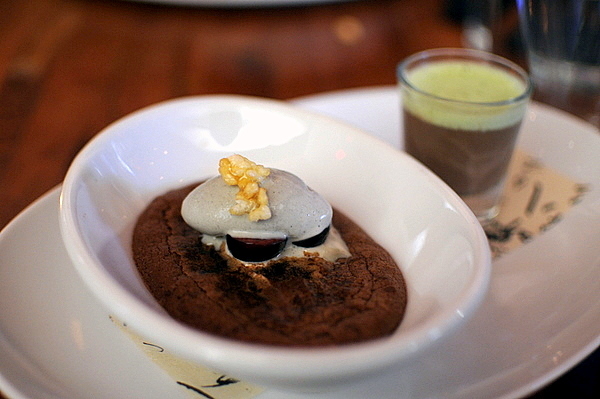 One of the more distinctive chocolate desserts, like many of the Perez's other creations this coupled sweet and savory elements resulting in a more complex flavor profile. Surprisingly the Xocopili was the savory component, laden with with red pepper and spice. 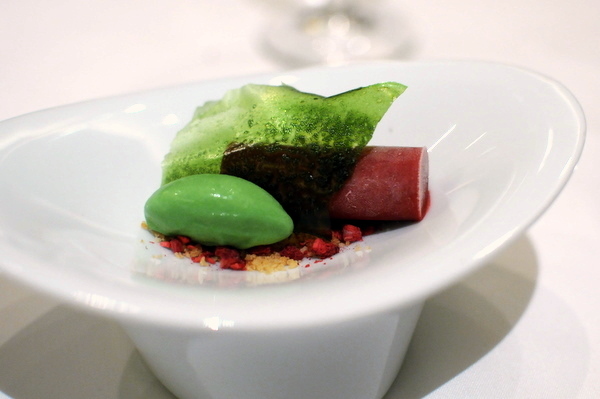 Sweetness was provided in the form of a beet sponge and concentrated raspberry gel. I loved the initial attack of the bitter herbal matcha which faded leaving a profoundly rich chocolate finish. 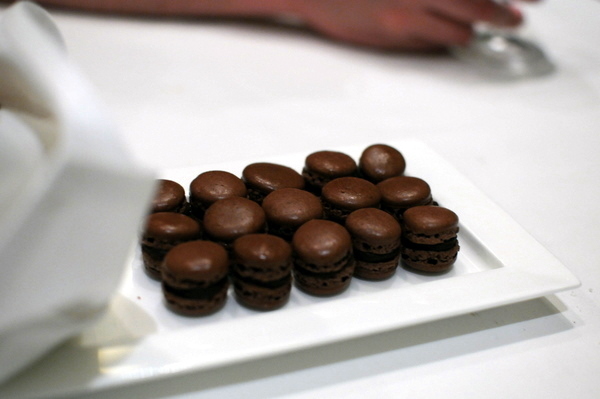 These were by no means groundbreaking but the simple well made mignardises capped a superb meal. 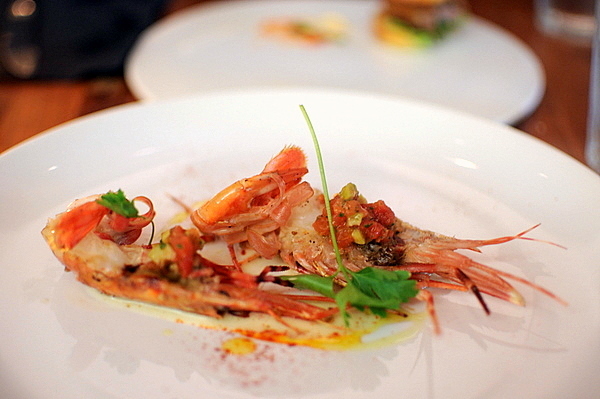 This meal was a return to the Sona of old, serving cuisine that is fanciful yet graceful; daring and delicious. I think by and large people find the idea of redemption appealing and are willing to extend second chances. I chose to believe that Myers is capable of rebuilding his tattered reputation by concentrating on what catapulted him into the limelight in the first place. My sincerest hope is that Sona does reopen with Myers (a little wiser and humbler) where he belongs; in the kitchen. 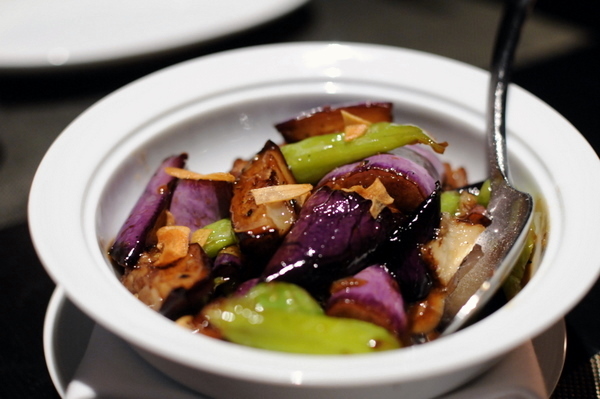 Both Wolfgang Puck and Executive Chef Lee Hefter have an affinity for Asian techniques that are readily apparent in the food at Wolfgang Puck's flagship Spago in Beverly Hills. WP24 turns the model on its head and instead of serving Asian-inspired Western cuisine, applies the Western emphasis on quality, service, and decor to traditional Asian dishes. Though Puck and Hefter had input into the restaurant, day-to-day operations are overseen by Chef de Cuisine David McIntyre. Chef McIntyre got his start at Patina before joining up with Puck first at Spago for a number of years then as a consulting chef at CUT. He struck out on his own briefly and opened Crescent Heights Kitchen and Lounge prior to rejoining Puck with the opening of WP24. WP24 is locate on the 24th floor of the Ritz-Carlton in Downtown and the restaurant affords a grand view of the meager LA cityscape. 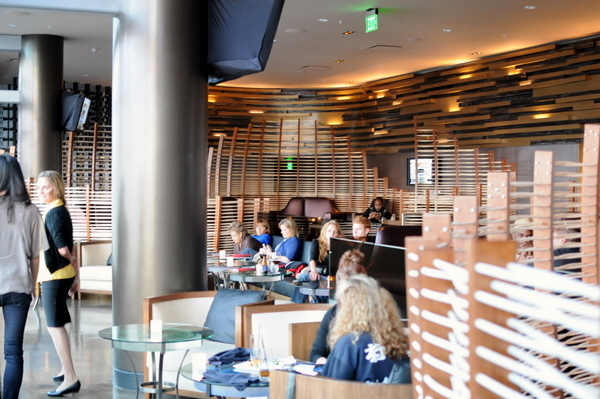 The interior consists of two bars, a lounge area, and a main dining room. The lounge offers a selection of pan-asian small plates while the formal dining room serves modern interpretation of Chinese cuisine. The bar is done in tones of black and grey with a clean contemporary feel. 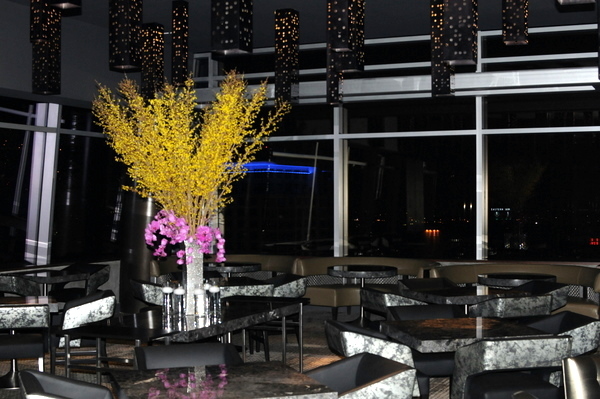 Just beyond the bar is a warm inviting lounge area with light wood "nests" giving diners a modicum of privacy. After the elaborate lounge, the spartan main dining room seemed almost like an afterthought. 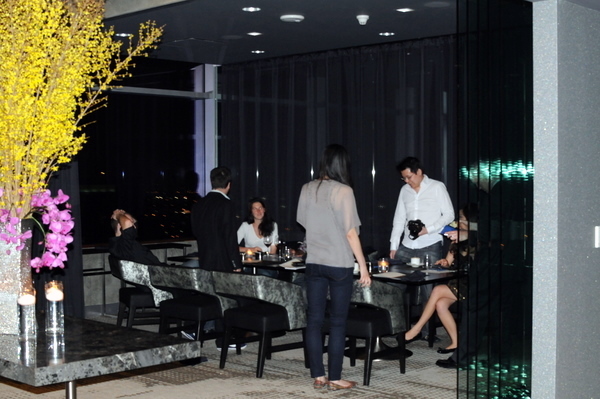 The wide open space is divided into a nomral dining area and a private dining area with two tables. We were seated at one of the two private tables while another party was at the other. A gauzy black curtain was draped between us but we were still able to see the other party which was distracting at times. 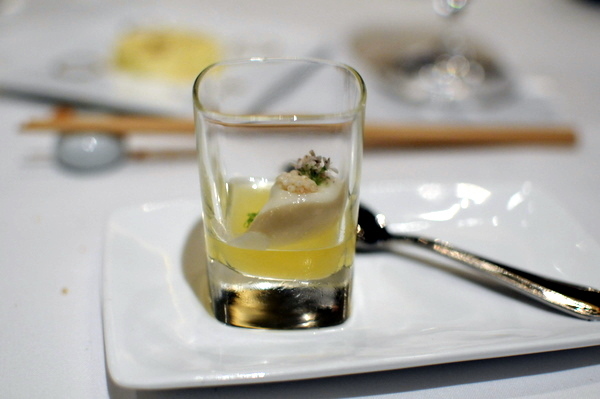 The meal kicked off with a set of small plates similar to the amuse courses that open the tasting menu at Spago. 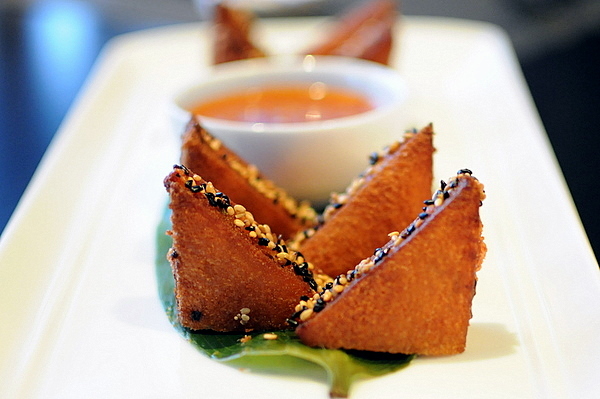 Apparently the meal at WP24 always kicks off with a plate of prawn toast. The subtle fishiness of the prawn coupled with the garlic chili sauce was very reminiscent of the dipping sauce at Brodard. Hard to go wrong when you take lobster and prawn and stuff it inside a crispy skin. By itself the spring roll didn't taste especially unique. 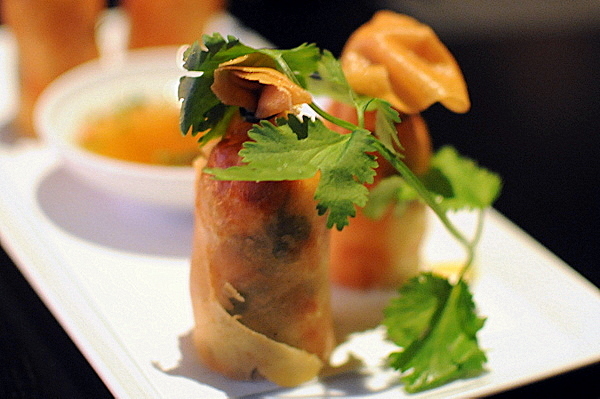 Rather it was the sauce which gave the spring rolls an vibrant fiery sweetness. 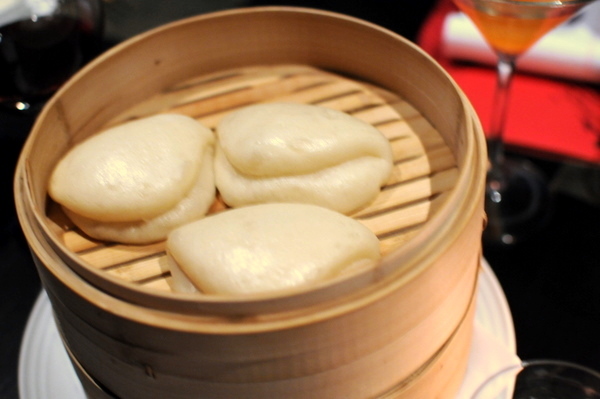 These looked exactly like the ones my mom used to make, down to the layer of glaze and black and white sesame seeds. The flavor was spot on as well, with a lingering heat that built steadily. Duck liver definitely isn't a traditional ingredient but when the resulting combination tastes this good who cares. 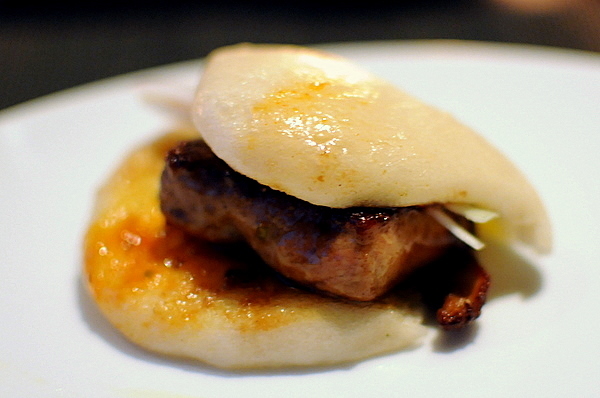 Both the bao and the sweet and sour sauce play very well with the duck liver, adding the sweetness that foie gras craves but it the contrast from the sprig of fresh scallion that makes this work. 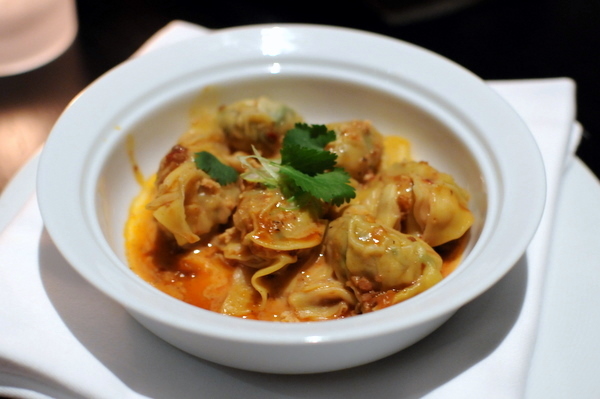 Chicken filling not withstanding, these were actually fairly traditional wontons. 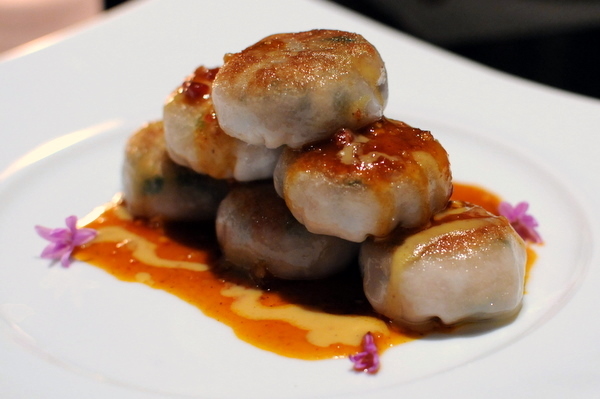 Paired with the hot chili oil they reminded me of "hong you chao shou" or Red Oil Dumplings. Easily one of the best dishes of the night. 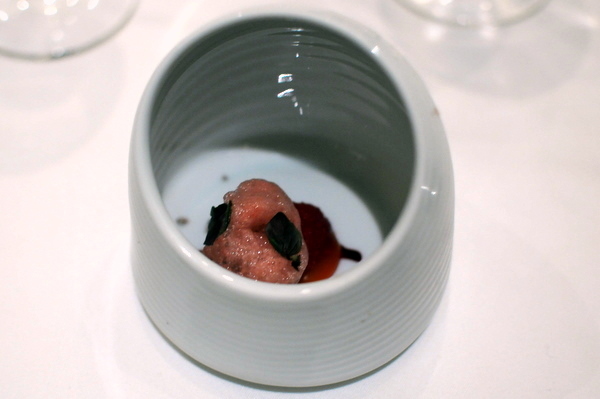 The dumpling skin had a complex texture coupling the chewiness of the glutinous rice with a charred crispy top. The combination of the crab and pork was equally effective, a delicious mixture of sweet shellfish and rich pork was finished with a the horseradish-tinged flavor of the mustard soy sauce. I am of the opinion that quail should be served as simply as possible, allowing diners to appreciate the decadent oiliness of the crisp skin coupled with the natural smoky sapor of the meat. The crunchy batter and thick vinegary glaze were enjoyable but might have been better suited to a milder bird. Had this been crispy chicken I probably would have applauded the strong tang and spice of the sauce. Considering the heavy Chinese theme to the dinner so far this next course felt somewhat out of place. The curry sauce itself was spot on and would have fit right in at an upscale Indian restaurant, spicy with a gentle sweetness, a very nice change of pace from the harsher sauce of the previous dish. Unfortunately the prawns themselves were dull and rubbery, I suspect they overcooked in the time it took to present the dish to the table and to plate the individual servings. Even though lobster with black beans is a fixture of every Cantonese seafood restaurant, I prefer to have lobster fried with ginger and scallion preparation as the black beans can sometimes overwhelm the palate. As expected, the sauce was a riot of flavors with nothing standing out in the salty, spicy, and sour cacophony, least of all the natural flavor of the lobster itself. It seems a bit strange to have back to back lobster courses, though this dish was lobster mostly in name only. 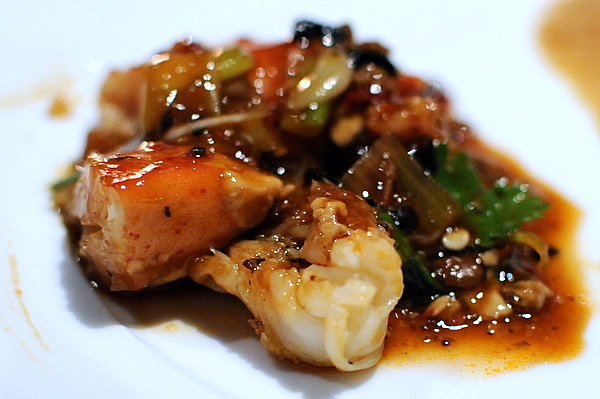 Instead the highlight here was the XO sauce, which is a chili oil with onion, garlic, ham, dried shrimp and scallops. The name of the sauce comes from the Chinese love for all things cognac and the term XO is often used to mean high quality. I thought the sauce added a slight umami-tinge coupled with a very ligh fish sauce like pungency from the scallops and shrimp. No Chinese banquet would be complete without a roasted duck. 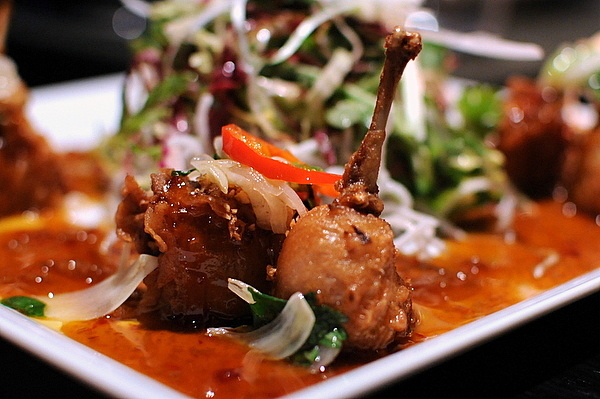 We were presented with the whole duck before it was chopped, deboned and drizzled with a sickly sweet sauce. 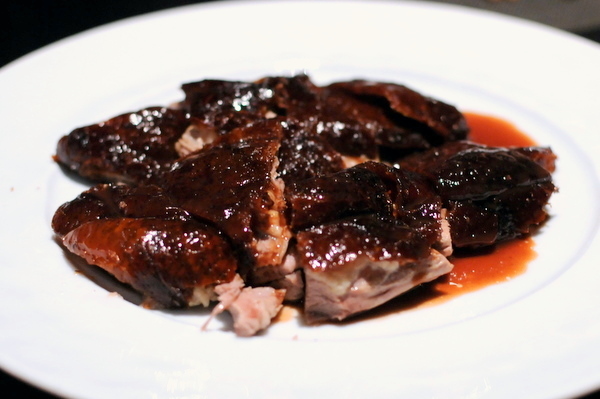 With beautifully crisp skin and just the right amount of fat, this would have been one of the better Peking duck preparations were it not for the accursed sweetness of the sauce. This reminded me of "hao you ban mian" or noodles with oyster sauce, a lunchtime staple of my youth. 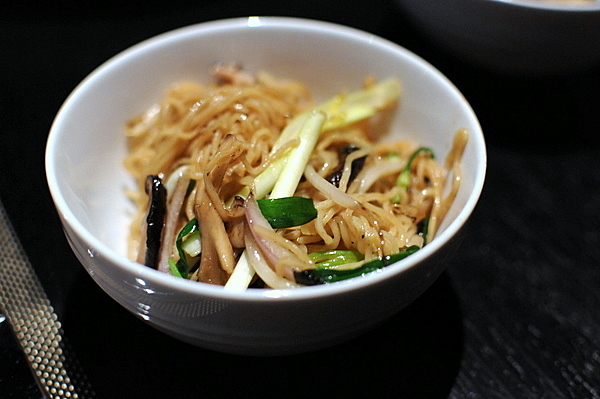 The noodles are lightly seasoned, drawing on the flavor of the chives and the mushrooms rather than any sauce. I guess this is the restaurant's take on "fa shi niu liu" or French-style beef. 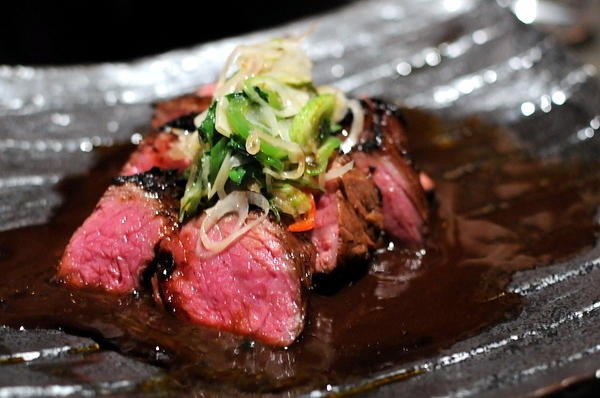 The beef itself is an example of the ideal American Wagyu, extremely tender and loaded with visible marbling but still possessing a profound beefy flavor. 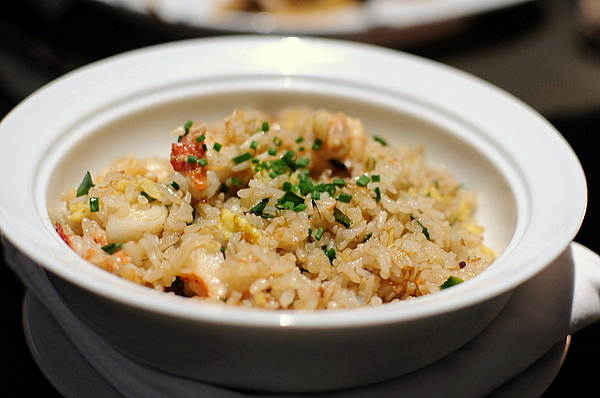 The topping of scallion and cilantro helped to counter the heaviness of the dish. 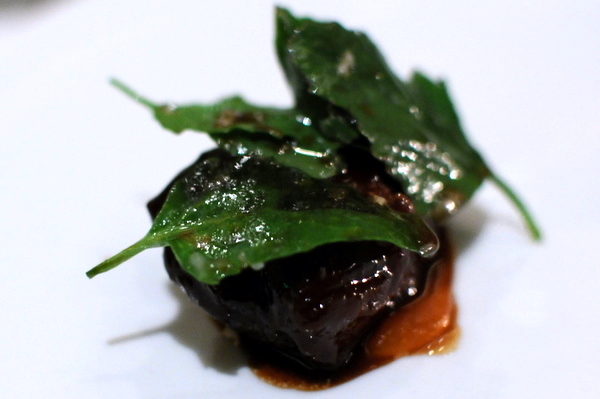 The grilled eggplant and shishito peppers proved to be unnecessarily heavy and added a vegetal note that was out of place against the beef. This brings us to dessert. My companions and I were joking that we might be getting some shaved ice or red bean soup but the desserts proved to be far more elaborate dishes using Eastern ingredients but Western techniques. 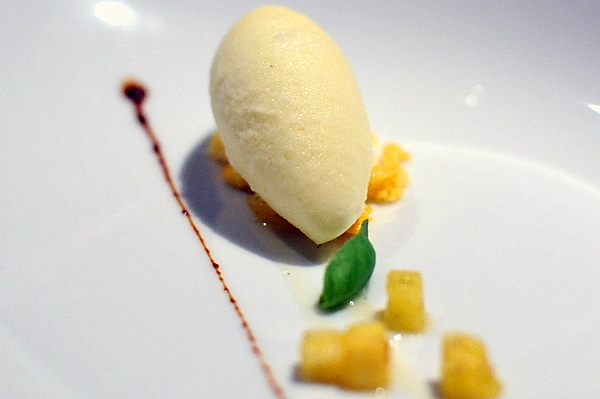 A simple vanilla sorbet, very lively and refreshing due to the bright fragrance of the pineapple, somewhat reminiscent of pineapple and coconut ice cream. 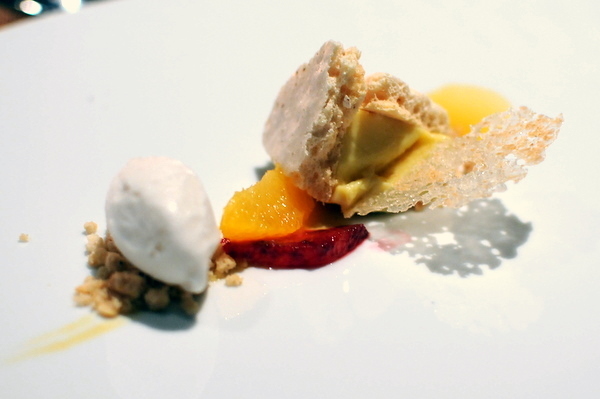 The first dessert sounded like it should have been up my alley with the citrus and meringue. The citrus proved to be quite enjoyable but the meringue felt dry and flat, with none of the sugary crunch that makes the dessert so good. One of my companions who has some experience in pastry said it had to do with the way they dried it. 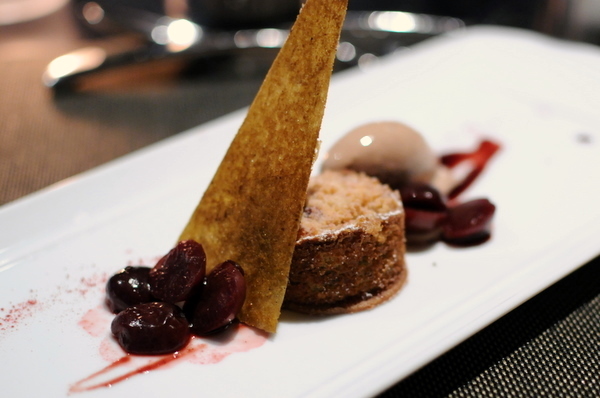 The second dessert proved more to my liking, with the interplay of the tart cherries and sweet crumble cake leading the way. 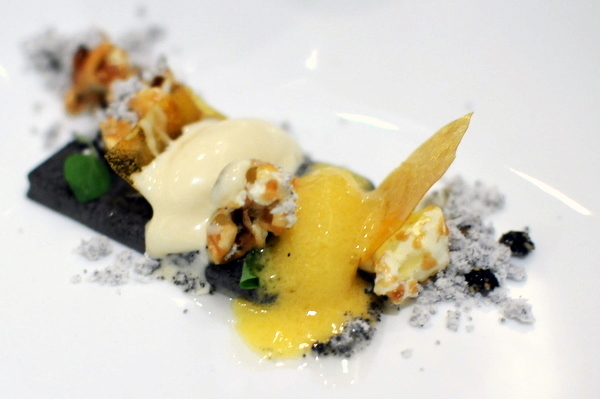 The curry crisp was an interesting touch, adding a exotic savoriness to the dish. The key to WP24 is approaching the restaurant with the right perspective. I thought the price was quite high for the food we were served, though I have been biased by a lifetime of cheap Chinese food. Judging the food alone, the ingredients were certainly of a higher standard than your typical SGV restaurant and the effort that goes into the food was far beyond the norm for Chinese food. The initial courses were excellent, a mix of traditional and innovative dim sum that compare favorably to most Cantonese restaurants I've been to. 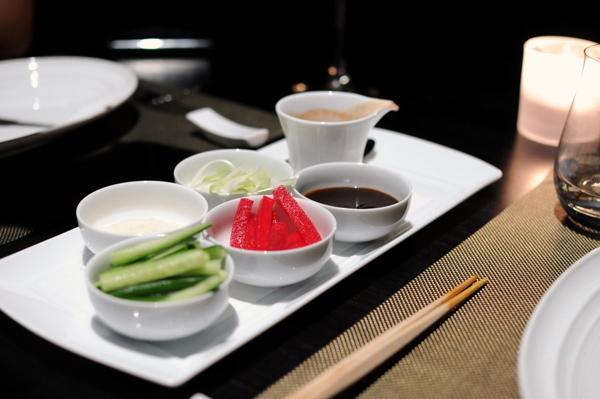 In the later courses, the sauce became more important and the food was consistently too sweet for my taste. Some of my companions regarded the meal differently, looking at the experience holistically and taking into account details that are often absent in a Chinese restaurant such as a serious cocktail and wine program, attentive service, beautiful scenery and decor (at least in the lounge). 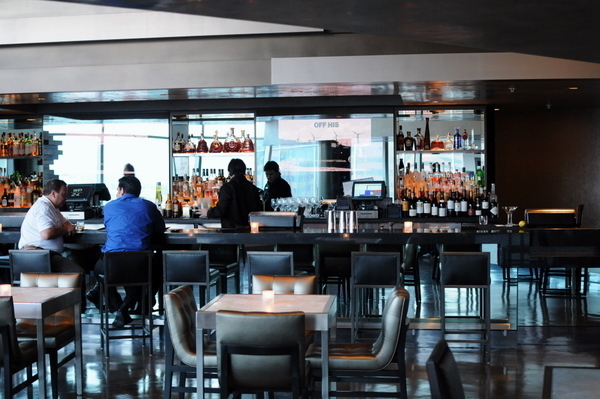 With that in mind, I think the best way to enjoy WP24 is to stick to the lounge, grab some dim sum, have a cocktail and watch the sun set over the city.